I think that it goes without saying that moms are busy. If you looked at our after school activities for two kids you might wonder where how we fit everything in that short period of time. From one practice to another, there can be a lot of quality time spent in a car. As the kids get older, the idea of carpooling with other parents is a welcome relief. The obstacle to this idea scenario, the booster seat. How many families carry a spare booster seat or two in a car? Personally I don't have space for extra stuff. 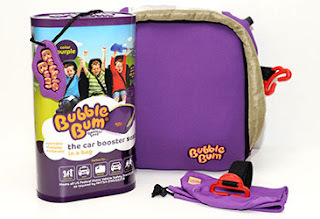 Luckily there is a new solution to the booster seat issue, BubbleBum. BubbleBum is an inflatable, portable booster seat for kids ages 4-11. The whole device folds flat. Stuff it in your purse, backpack or bag and you have a booster seat at the read. Another option is to keep one in the stow and go section of your car. No more excuses why a child can't be protected. I'm sure that some of you are wondering if an inflatable booster seat is safe. According to the inventors, BubbleBum has used technology to create stability in the inflatable section. The inflatable bladder is made of a similar durable material as life rafts (not like a beachball) and the seat cover and webbing form an integral part of the structural integrity of the product. The seat can be inflated in just 20 seconds by mouth. It is reusable, portable and lightweight. Also, it comes with a positioning clip that holds the belt flat on the child's lap, not across the belly. For our family, the BubbleBum is perfect for an upcoming vacation. Any family that has traveled with kids can attest to the amount of stuff a family may have to bring. Whether you are traveling by plane or car, you need to make sure that your child is safe. With the Bubble Bum you can easily carry your booster seat with you. It isn't bulky nor will it take up a lot of weight in your luggage. Plus, you aren't adding additional fees to your trip. After our vacation, I will be keeping my BubbleBum in the car. With carpools, you never know if you might need to take an extra child or a friend might offer to help me out. My son can throw the inflatable booster seat in his backpack and I know that he will be safe in the car ride home. 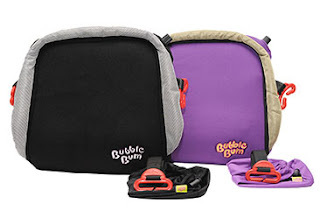 The BubbleBum can be purchased online for $39.99. The device comes in black or purple. Keep your child safe throughout all his travels with the portable, convenient and useful BubbleBum. I would like to see the BubbleBum in action! I'd need to see how it works to decide, but the concept is pretty cool. That sounds like a cool idea. I'd love to see a video too! Love the idea! I know this will come in handy soon!